like usual Lia, always cute bento. 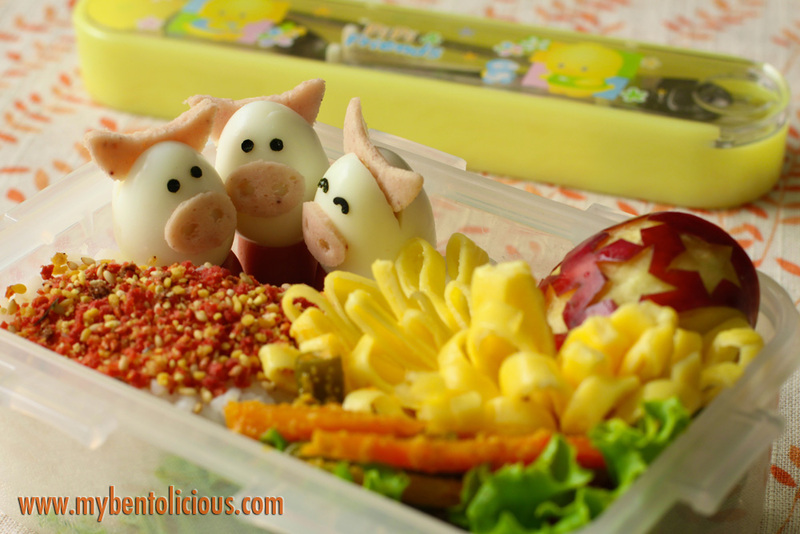 Hope someday I can make cute bento for my son..
Oh no, how awful Lia. I am so upset even when I lose wifi at home and I have to use the desktop upstairs! So spoiled. On the other hand, it would be nice to "hang out" at Starbucks too...! I hope your husband can convince them to fix it quick. Anyway, you have managed to upload the cute bento pic for us to enjoy, thank you! Love your talent with the quail egg decorations; I am not good with that at all, hee hee! Very nice. What is the pigs'eyes made of? Thank you. Those piggies are soooo cute! Wonderful bento! @once_alifetime : Thanks Elisa! The pig's eyes were made from nori (Japanese dried seaweed sheets that usually used for making sushi). SO funny that your husband is your household's customer relations expert... i'm not allowed to talk to the landlord anymore because i get too angry/hostile, so my boyfriend is also the one who deals with complaints and relations like that. good luck with your wifi! Sorry to hear about your internet! That's no fun! The bento is super cute, I just love the little piggies! Those 3 lil pigs are so cute! ... hope you'll get a speed internet connection soon. @BentoForKidlet : Thanks a lot Jenn!